PUBLIC INTEREST PETITION UNDER ARTICLE 32 OF THE CONSTITUTION OF INDIA FOR ISSUANCE OF A WRIT. 1. The Petitioner is constrained to invoke the extra ordinary, highly prerogative jurisdiction of the court by way of the present PIL as the present matter concerns larger public interest , credibility of the institution of judiciary and the justice dispensation system in India. That the petitioner is filing the present writ petition in public interest. The petitioner has no personal interest in the litigation and the petition is not guided by self-gain or for gain of any other person / institution / body and that there is no motive other than of public interest in filing the writ petition. That the petitioner has based the instant writ petition from authentic information and documents obtained from various governments departments/portals/RTIapplications. That the petition, if allowed, would benefit the citizens of this country generally as rule of law is essential for democracy and such brazen violation of law by the respondents can be stopped by the orders of this Hon’ble Court only. That the persons affected by such acts of the State are numerous and are not in a position to approach the Hon’ble Court hence the petitioner is filing the present PIL on behalf of such affected persons. Whether the High Court of Mumbai can deviate from the standard prescribed judicial process and grant orders in a criminal appeal when the appeal itself has not been presented in the manner prescribed under the law and the process prescribed under the High Court rules of Mumbai and whether the entertaining of such petition by the High Court at the pre-mature stage would not amount to hostile discrimination with other such similarly situated appellants whose appeal has not been taken up by the High Court earlier? Whether the High Court under exercise of its powers of appeal under the Criminal Jurisdiction can ignore the rules governing the listing of the criminal appeals before the bench and can grant orders in a criminal appeal which is neither filed properly nor has any extenuating circumstances leading to the exemption being granted by the High Court out of way? 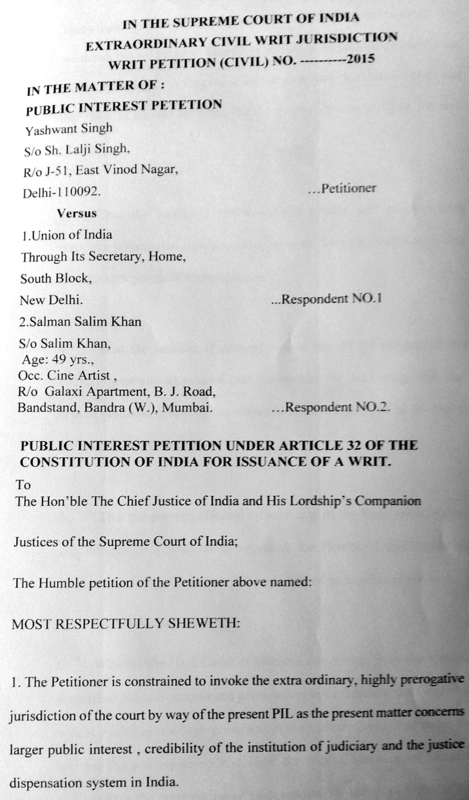 Whether Article 14 of the Constitution of India is only a decorative legal provision for the courts dispensing justice and whether the High Court can discriminate in listing and hearing of a petition out of turn in gross violation of law when the said appeal is neither filed in proper format nor accompanied with the impugned judgement and sentence order against which he said appeal has been filed. Whether Article 14 of the Constitution of India does not mandate equal treatment of all before the courts ? Whether the present case does not call for interference by this Hon’ble Court in its wide powers as enshrined under Article 32 of the Constitution of India? Whether the manner in which the Courts of Sessions and the High Court of Bombay has dealt with the present case are not bound to cause serious apprehensions in the minds of the general public that the judicial process in India is prone to be exploited and misused by the influential persons wherein the courts have also resorted to pick and choose instead of translating the maxim of “Eqaulity before law” into reality and give similar treatement to all accused/convicts irrespective of their social, economic status? Whether the deviation by the Courts of Session in dealing with the present matter is not irregular and need the indulgence of this Hon’ble court for remedifying the wrong done and the dent caused to the entire judicial system of the country? Whether the act of entertaining the criminal appeal by the High Court of Bombay is not irregular and against the established practice being followed since long? Whether the act of Bombay High Court in listing the Criminal Appeal filed by the respondent No.2 for final disposal on 15/7/2015 is not a hostile discrimination with the persons whose appeals are awaiting listing since long and some of them are languishing in jail since years being convicted by the trial court? Whether the act of the Court of Sessions , Bombay in deviating from the dictum of Allauddin Milan vs State of Bihar [1989 SCC (3) 5], without any valid reason has not caused serious irregularity in the criminal justice system and has ultimately helped the respondent No.2 in gaining benefit of suspension of sentence by the High court? Because, the High Court of Mumbai can not deviate from the standard prescribed judicial process and grant orders in a criminal appeal when the appeal itself has not been presented in the manner prescribed under the law and the process prescribed under the High Court rules of Mumbai and whether the entertaining of such petition by the High Court at the pre-mature stage would not amount to hostile discrimination with other such similarly situated appellants whose appeal has not been taken up by the High Court earlier. Because, the High Court under exercise of its powers of appeal under the Criminal Jurisdiction can not ignore the rules governing the listing of the criminal appeals before the bench and can grant orders in a criminal appeal which is neither filed properly nor has any extenuating circumstances leading to the exemption being granted by the High Court out of way. Because, Article 14 of the Constitution of India is not a decorative legal provision for the courts dispensing justice and whether the High Court can discriminate in listing and hearing of a petition out of turn in gross violation of law when the said appeal is neither filed in proper format nor accompanied with the impugned judgement and sentence order against which he said appeal has been filed. Because, Article 14 of the Constitution of India mandate equal treatment of all before the courts. Because, the present case calls for interference by this Hon’ble Court in its wide powers as enshrined under Article 32 of the Constitution of India. Because, the manner in which the Courts of Sessions and the High Court of Bombay has dealt with the present case it is bound to cause serious apprehensions in the minds of the general public that the judicial process in India is prone to be exploited and misused by the influential persons wherein the courts have also resorted to pick and choose instead of translating the maxim of “Eqaulity before law” into reality and give similar treatement to all accused/convicts irrespective of their social, economic status. Because, the deviation by the Courts of Session in dealing with the present matter is irregular and need the indulgence of this Hon’ble court for remedifying the wrong done and the dent caused to the entire judicial system of the country. Because, the act of entertaining the criminal appeal by the High Court of Bombay is not irregular and against the established practice being followed since long. Because, the act of Bombay High Court in listing the Criminal Appeal filed by the respondent No.2 for final disposal on 15/7/2015 is not a hostile discrimination with the persons whose appeals are awaiting listing since long and some of them are languishing in jail since years being convicted by the trial court. That the petitioner is constrained to approach this Hon’ble Court against the wide public outcry happening due to the arbitrary and irregular handling of the matter not only by the Sessions Court at Mumbai but also the High Court of Mumbai which is causing a serious doubt over the intention and conduct of the judicail system in India and the public at large is shocked and surprised to see the twisting of the law by the influential persons which makes a mockery of the rule of law in the country and more specifically the equality before law. That the facts related to the present matter are such startling that will shake the judicail conscience. That the respondent No.2 is a renowned film star and a celebrity which has influence the young generation of the country by his acting in the films and has innumerable number of fans in India as well as outside India. He behaved in most irresponsible and rash manner and caused a serious road accident while driving in the influence of liquir leading to the registration of FIR on 27/9/2002 wherein he killed one person on road and injured other four persons due to his conduct. That the FIR was sent to trial before Sessions court at for Greater Bombay at Bombay and registered as case No. 240 of 2013 on the basis of CR No. 326/2002 at Ps Bandra, Mumbai. The court framed charges under Section 304, Part-II, 337,338IPC read with Section 134(A) (B), 187, 181, 185 MV Act. That the court however adopted a peculiar and unconventional method and proceeded to pass the sentence order on the same day and sentenced him for a period of five years and few months under different sections of IPC and MV Act alongwith fine on the same day which is in variation of the established practice of sentencing the guilty on a subsequent day keeping in view the ratio of the judgement of this Hon’ble Court in Allauddin Milan vs State of Bihar [1989 SCC (3) 5], the copy of the juddgement and sentence order of the Court of Sessions, Greater Bombay, Bombay in Case No. 240/2013 dated 6/5/2015 is being filed herewith as ANNEXURE-P-1. That the said sentencing was done till evening at around 4.00PM as reported in the media however the matter was mentioned by the counsel for the said respondent No.2 before the High Court of Mumbai on the same day in the evening and a spacious plea that the copy of the judgement was not handed over to the said respondent was taken however no prejudice being caused due the same was shown. The High Court strangely and giving the go bye to the established practice in such matters passed orders dated 6/5/2015 and granted suspension of sentence to the accused, the respondent No.2 despite the fact that the copy of the impugned judgement and sentence order was not placed before the court neither any appeal as per the format filed, the copy of the order dated 6/5/2015 in Criminal Appeal No. 572/2015 passed by the High Court of Bombay is being filed herewith as ANNEXURE-P-2. That vide the orders dated 6/5/2015 , the High Court of Bombay has ordered for the placing of the Criminal Appeal for hearing on 8/5/2015 before the bench accordingly, the same was placed before the bench for hearing on 8/5/2015 and the court passed the orders dated 8/5/2015 thereby suspending the sentence of the respondent No.2, the copy of the orders dated 8/5/2015 in Criminal Appeal No. 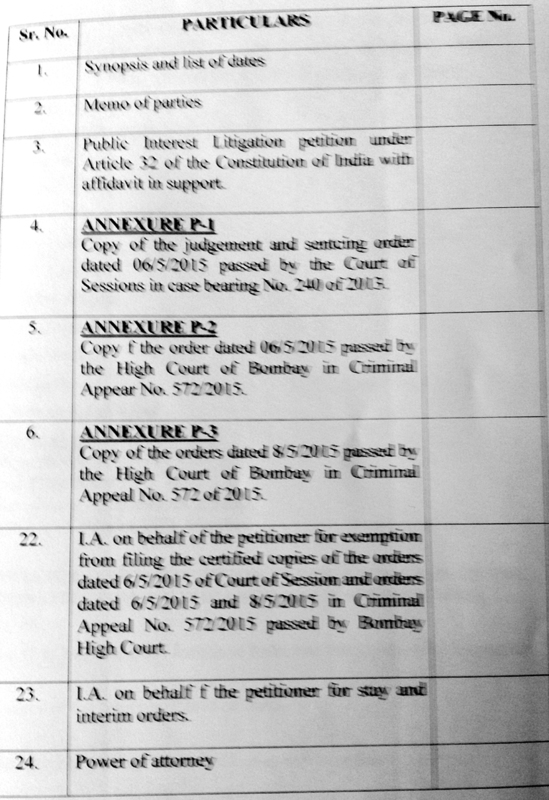 572/2015 as passed by the Bombay High Court is filed herewith as ANNEXURE-P-3. That entire chain of events was being covered by the print media, electronic media and social media and the people were surprised by the manner in which the relief was granted to the respondent No.2 , bending the rules and going out of way which is in complete disregard of right to equal treatment to all in law. It is apparent that the respondent NO.2 was in a position to exploit the deliberate loopholes in the law hence was granted relief on flimsy grounds and by taking new routes in dispensation of justice. That the people at large are shocked and surprised to see that even before the ink on the sentence order passed by the Court of Sessions was dry and even before the copy of the same could be served on the respondent No.2, the said order was challenged before the High Court of Mumbai and strangely enough the court entertained the Criminal Appeal filed without the copy of the judgement and odered for the suspension of sentence with promptness and the Court of Sessions remained waiting for the said order of suspension of sentence till late evening till 7.30 PM which is not the standard practice in the courts. It is strange and intriguing that the Court of Sessions remained waiting for the orders of the High Court till late in the evening despite the closing hours just because a celberity was involved . That the social media is full of adverse comments on such a bending of the process which is bound to cast bad impression on the general public on the impage of the judiciary. Most of the comments on social media raise a finger towards the process of dispensation of justice which is dangerous for the country as the public at large is loosing faith in the judicial process and pointing out that the influential can manipulate and manage any relief for them by twisting the law. That to the knowledge of the Petitioner the Court of Sessions Bombay has not passed the judgement of conviction and sentencing order of any accused on the same day earlier neither the court has ever waited for the orders from the High Court till 7.30 PM in the evening. The aforesaid behaviour of the Court of Sessions amounts to giving a special treatment to the case of the respondent No.2 and raises serious questions on the entire justice dispensation system. That the petitioner being a social activist and a person with concern over the social issues is thus before the court seeking indulgence of the court in the matter so that the faith of the common man in the judicial system is maintained and the public at large does not loose their faith in the judicial system which will ultimately damage the rule of law in the country. That the petitioner being a man of media has come across very hard hitting comments and outcry against the entire judicial system of the country where the people are casting serious aspersions on the entire judicial system not only in conventional medial but also on social media which has now become the mouthpiece of society. The petitioner has compiled some of such comments and is filing the same before the Court although the petitioner does not subscribe to the extreme views being expressed therein. The said views, comments are a stark reality of the society and need immediate attention by this Hon’ble Court so that the society at large does not loose its faith in the entire jusicial system which will be very dangerious for the democracy. Some of the comments downloaded and printed by the petitioner after 8/5/2015 alongwith their printouts and true translated copies is being filed herewith as ANNEXURE-P-4. That the present petitioner has not filed any other petition in any High Court or the Supreme Court of India on the subject matter of the present petition. Issue, a writ, order or direction in the nature of Certiorari or any other appropriate writ, order or direction in favour of the petitioner and against the respondents thereby staying the orders dated 8/5/2015 passed by the Bombay High Court in Criminal Appeal No. 572/2015 filed by the respondent NO.2. Issue, a writ, order or direction in the nature of Certiorari or any other appropriate writ, order or direction in favour of the petitioner and against the respondents thereby staying the suspension of sentence order dated 8/5/2015 passed by the High Court of Mumbai in Criminal Appeal No. 572/2015 and direct the respondent No.2 to surrender before the jail authorities in accordance with the rules.